Our collar stays, like custom dress shirts, provide a luxury experience rivaled by none. Crafted in high quality material with a unique antique finish, our stays keep your collar in place ensuring a polished finish to the most distinguishable feature in any dress shirt. Quantity: 4 pcs Collar Stays. Color: Cream-coloured/ White. Arrived in a high grade branded gift box. Great Gift Idea for Him- Father, Husband, Best Man, Groomsmen, Father of the Bride. 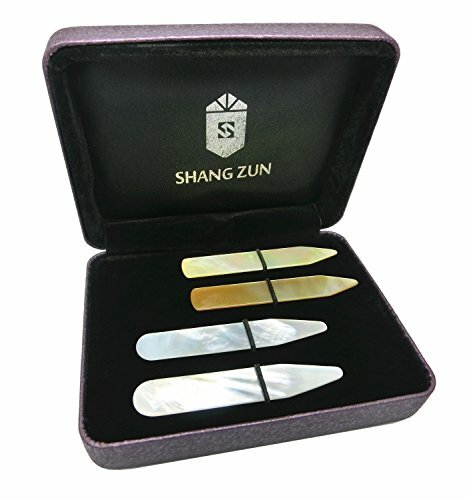 These collar stays are made of Natural Mother of Pearl, adopted high polished, classic design adds functionality and unique style to your look.